It was the straw that broke the camel’s back. On the afternoon of April 29th, 1992, the long simmering tensions between the LAPD and the Black residents of Los Angeles finally exploded. The Acquittal of four Los Angeles police officers in the brutal beating of motorist Rodney King proved to be one slight too many. That the beating was caught on videotape ultimately didn’t make much difference to the jury. Even in the face of irrefutable evidence, some people refused to acknowledge the obvious. The destruction that followed proved shocking to many, despite the many warnings issued by the rap artists of the day. In the years immediately preceding the riots, they had tried to alert Americans to the coming storm. As its title plainly spells out, Uprising: Hip Hop and The L.A. Riots documents the most infamous case of civil unrest in American history. It also looks at the daring form of music that anticipated the whole ugly affair. Well before the first store was looted or the first car overturned, Ice-T, N.W.A, and Ice Cube had fired sonic warning shots. Those shots reverberated around the world and resonated with young people of all races. Still, they went largely unheard by much of the American mainstream. Director Mark Ford offers not only a look back at that tumultuous time, but gives that generation’s rap artists their due as both griots and prophets. Uprising fashions a narrative via archival footage and interviews that follow the progression of the riots from alpha to omega. Vintage MTV clips of N.W.A and Ice Cube offering their insights are strewn throughout. Like the riot itself, Ford organizes everything along a steady progression that grows exponentially until finally going nuclear. These images are powerful, and their effect is cathartic. As the citizens of LA spring into action, it’s hard not to feel their anger and exhilaration. Angry mobs often swell as onlookers get swept up in the whirlwind. Uprising has that same effect, and takes the viewer along for the ride. It doesn’t offer easy moralizing or Monday morning quarterbacking. Uprising goes into Meta territory when it contrasts the experiences of two men with cameras who were at ground zero when all Hell broke loose. Filmmaker Matthew McDaniel stood outside of South Central’s First AME Church while community leaders congregated inside. He recorded the events with his Magnavox camera. That footage was fashioned into the documentary Birth of a Nation 4x29x92, which Dr. Dre referenced throughout his genre bending classic The Chronic. Meanwhile, photographer Bart Bartholomew became the target of an increasingly angry mob at Florence and Normandy. The musical selections are creepy yet appropriate. N.W.A’s “Approach to Danger,” which sampled a selection from Lalo Schifrin’s Dirty Harry score entitled “Scorpio,” makes the skin crawl. Many of the most compelling moments in the latter half of Uprising come by way of Henry Watson, the man who infamously held down Reginald Denny as rioters beat him bloody. Watson is unapologetic, and Uprising does not shy away from the sheer horror of his actions. Yet, somehow he doesn’t come off as truly villainous, but instead seems shockingly self-aware. In perhaps the most surreal moment of the entire broadcast, Korean store owners form their own makeshift militia to deal with the rioters. 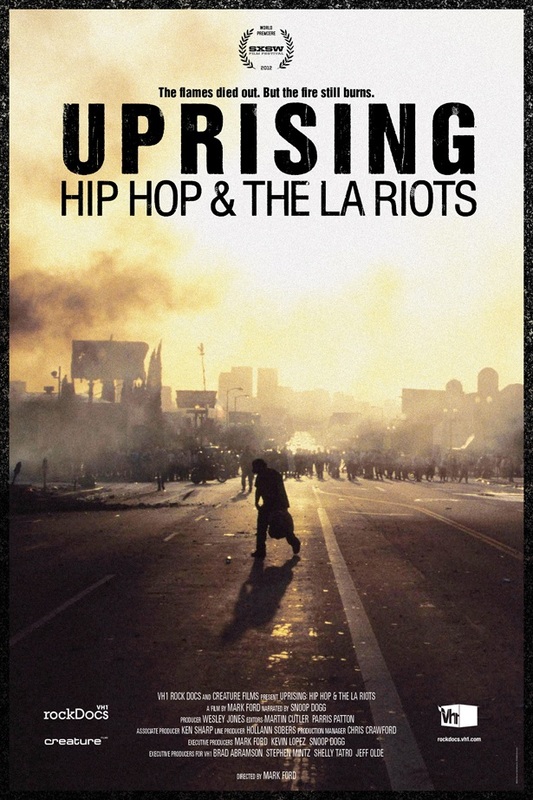 Uprising: Hip-Hop and The L.A. Riots is a troubling yet necessary work. It looks back at a time not altogether different from our own, and shows a populace equally tired of being treated like second class citizens. It doesn’t issue a challenge to the establishment, but instead a dire warning: This could happen again. Since the powers that be didn’t learn anything from it the last time, maybe a repeat of history is needed. The Black entertainers of that generation got the word out. Much of that music has stood the test of time. It was violent, misogynistic, and flat out negative. It was also a necessary evolution in the history America, much like the riots themselves. This documentary seems like a very interesting thing. I'm thinking about watching it and writing a review for College-paper.org review. That would be a nice experience for me and an interesting article.